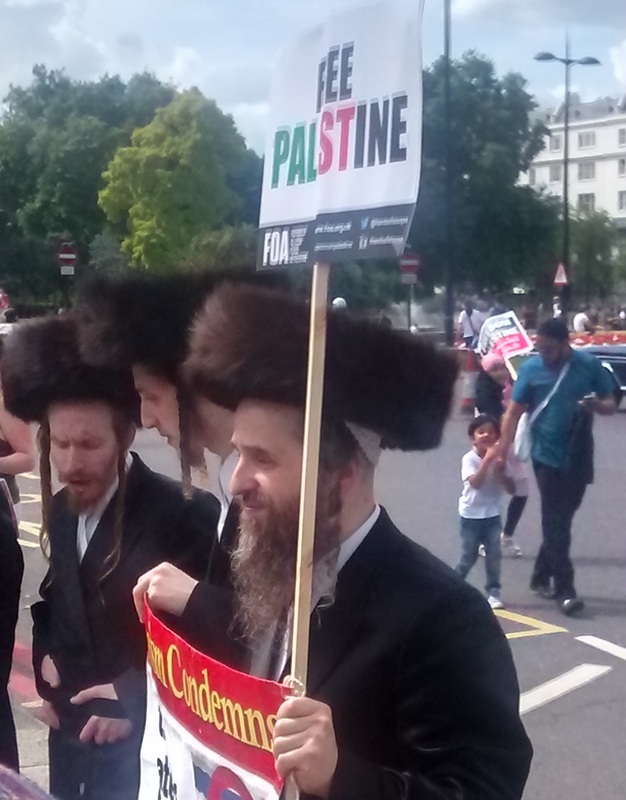 Protest for Gaza on Oxford Street. I don’t go on a lot of protest marches. In fact, the only big, proper protest march I have been on was the one in favour of fox hunting, when I reported on it for the Hastings Observer. Today’s march was similar, yet different. It featured the same good-natured canter through London’s beauty spots, adorned with placards, whistles and slogans. But while that rally was defending human’s right to kill foxes for fun; this protest, in contrast, defended human’s right not to be killed (for fun, or otherwise). c. I was interested to see who was on the march, and why they were there. When I pottered down to Portland Place, I was pleased to see that there was a significant crowd gathered. Not nearly as many as pitched up against the foxes, but still tens of thousands. 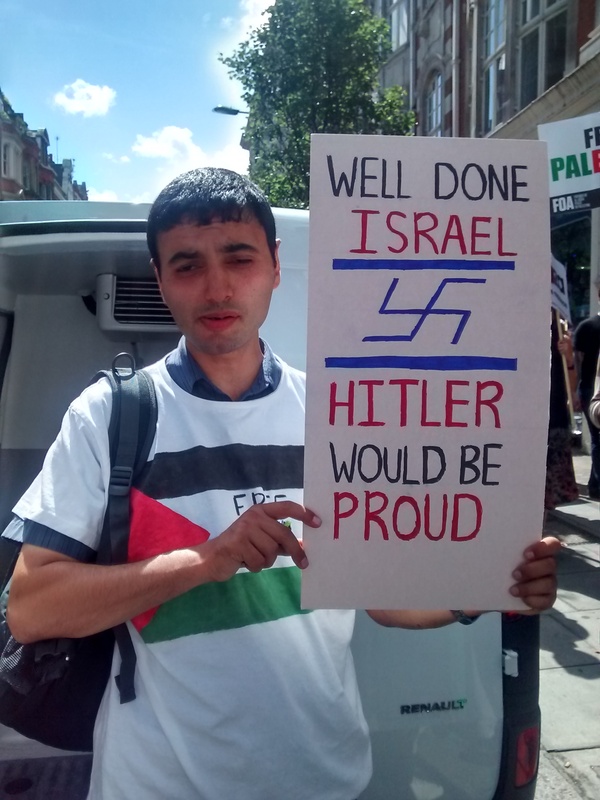 Almost the first person I saw was a young man pulling out a placard which conflated Israel’s actions with the Nazis. I asked for a photo, then explained that I found his sign insulting (idiotic, would have been nearer the mark). I was soon joined by a Jewish man who said much of his family was killed in the holocaust, and he found the sign offensive and insensitive. We got tangled up in an extremely polite argument, in which it became obvious that the man had a very loose grasp of history, and was beginning to regret bringing the banner out. I slipped away as they carried on their debate, and am glad to say, I did not see another banner of that kind for the rest of the afternoon. The people gathered outside Broadcasting House, in criticism of the BBC’s reporting of the conflict. I don’t think its reporting has been as bad as people have suggested. However, the BBC’s problem stems from two factors: a timidity in asking hard questions of Israel; and editorial guidelines which demand balance. That approach doesn’t work when the conflict itself is so desperately unbalanced. I bumped into a fellow QPR fan, who acted as a timely restorative after my previous encounter. 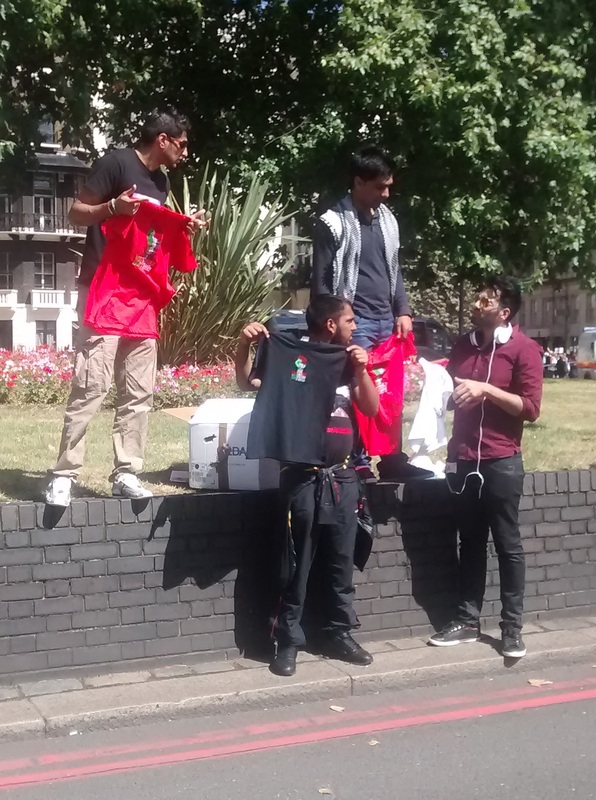 We discussed another grave, internecine conflict: between Joey Barton and Adel Taarabt, before he handed me a socialist leaflet and tottered off. 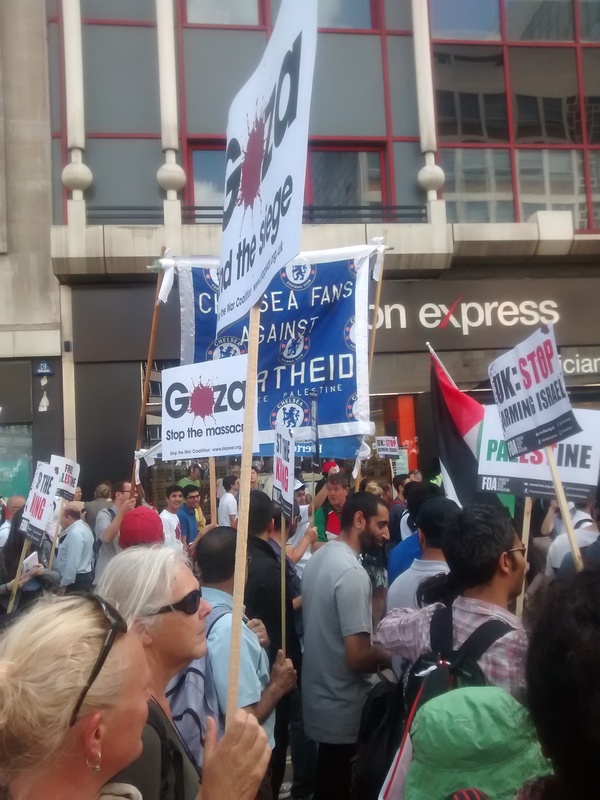 To my surprise, and pleasure, I noticed West Ham and Chelsea fans carrying banners in support of the people of Gaza. This is good not only because it shows football supporters standing for something more than their team, it shows how many different types of people feel strongly about this issue. I next got talking to a mother of three from south London, who was pushing two children in a buggy, and carrying a tiny baby in a sling. She said, simply: “I hope we can make a difference. I hope we will be listened to.” We had a lovely chat where she explained her determination to come out and show her support, despite having three children. “You have got to do something,” she said. We walked around the US embassy, which saw people shouting: “USA, shame on you” to a large, unimpressed building, with a bored-looking security guard stood outside. Which is perhaps why I don’t go on many marches. That said, I am glad I went on this one. 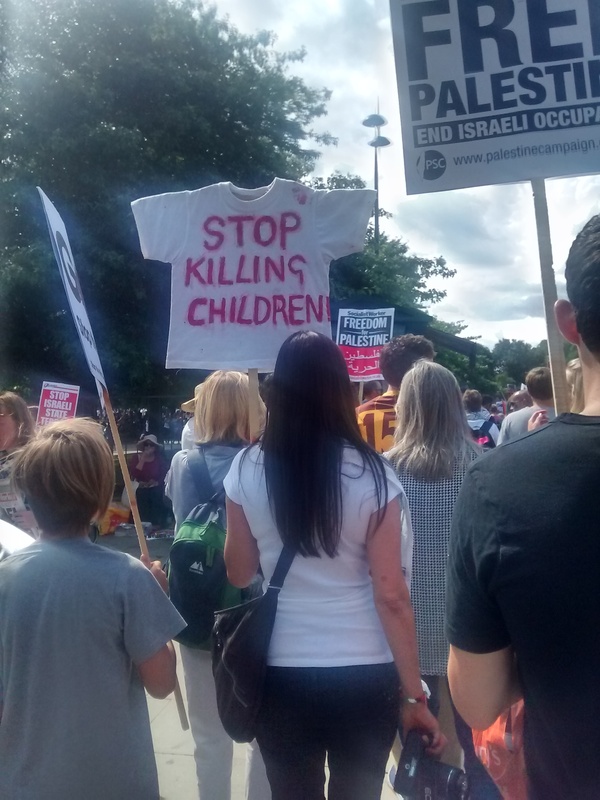 I saw mums, dads, teenagers, old people, business people, tourists, from just about every walk of life, walking through the streets to show support for fellow humans suffering a very obvious injustice. I am not presuming that much will come of this protest. After all, the protest to defend an Englishman’s right to frighten the life out of foxes came to nothing. 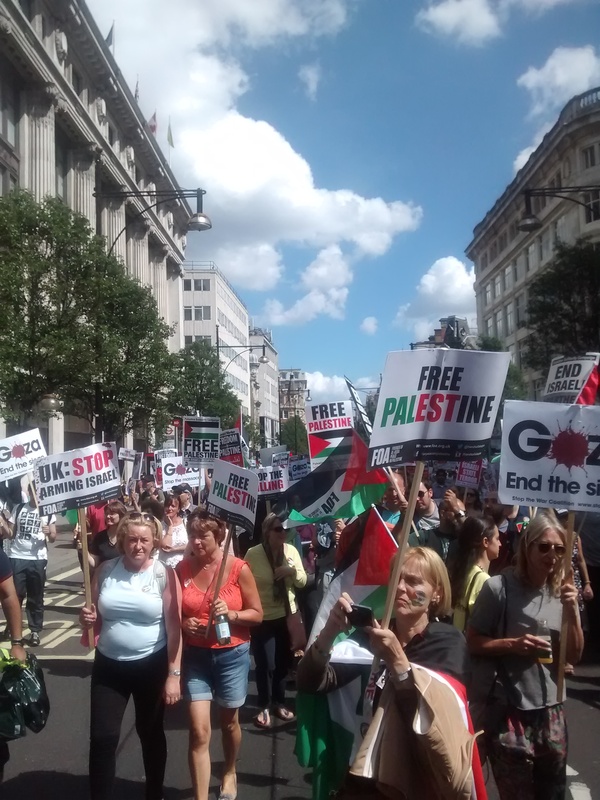 However, simply to see that there is a groundswell of support for the Palestinians, which today is less easily ignored by our Prime Minister, made it worth it.